Pakistan Army’s Cobra gunship helicopters pounded three militant hideouts in Qutub Khel area on the outskirts of Miranshah Friday, killing at least 12 suspected terrorists, as the number of civilians fleeing an expected ground offensive passed 200,000. “It was an integrated action by cobra gunships, artillery and snipers. 12 terrorists including foreigners were killed in the strikes. Huge cache of arms and ammunition was also destroyed,” said a statement issued by the Inter-Services Public Relations (ISPR). The authorities eased a shoot-on-sight curfew on Wednesday to give civilians a chance to leave before troops begin a full-blooded ground operation. A senior security official earlier said that helicopter gunships targeted militant hideouts in an early morning raid, killing up to 20 militants. The ISPR statement further said that six fleeing attempts by the terrorists were foiled last night and three locals, who did not have any identity proof, were apprehended while trying to flee from the cordon. Another 24 suspects, who were trying to flee in the garb of IDPs, have been apprehended at various strangulation checkposts in Mirali and Miranshah, it added. “Till now 200,000 persons have been evacuated from the area,” said the official military statement, adding that so far 11 families (92 individuals) have been enlisted in the IDPs camp in Bakkakhel of Bannu. It also said that 400 Afghan families had left North Waziristan Agency for Afghanistan through Ghulam Khan Border village on Thursday. “They were provided all required administrative assistance,” it added. “Total 20 booths i.e. 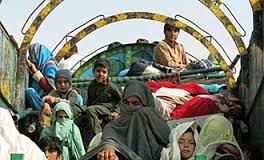 10 each for male and females IDPs are continuously functioning for expeditious registration and move out of Agency,” said the ISPR press release. The military offensive began last week after a bloody and dramatic attack on Karachi airport earlier during the month brought an end to months of largely fruitless government efforts to negotiate a peace deal with the Tehreek-e-Taliban Pakistan (TTP). Washington has long demanded action against militant hideouts in North Waziristan, which has served as a rear base for insurgents battling US-led forces in Afghanistan. The area, one of seven semi-autonomous tribal regions on the Afghan border, has been an important base for the TTP, which has killed thousands in bombings and gun attacks during its seven-year insurgency. The fighting also triggered a huge exodus of civilians from North Waziristan into Bannu, Peshawar and Kohat and across the border into Afghanistan. “Some 157,000 people have arrived in Bannu from different areas of North Waziristan,” Arshad Khan, director general of the Fata (Federally Administered Tribal Areas) Disaster Management Authority, said on Friday. Registration points and camps have been set up to deal with the influx of people in Bannu, but many prefer to travel on to stay with relatives in other areas. Thousands of people including women and children were seen travelling to Bannu by foot on Friday. WHILE WAR ON BORDERS – QUADRI IMRAN KAAFIRS GADAARS Making torubles inside pakistan !!! QUADRI IMRAN ARE al-haraams .